The lack of foresight and reactivity by even the largest global companies at the first signs of the 2007-2009 financial crisis underlines the fact that corporate intelligence capabilities are still far from adequate. Intelligence, to be distinguished from industrial espionage, serves the dual purpose of sounding the alarm when a company‟s strategy is off course - as well as continually providing all important decision makers with the right information on the business environment to profitably execute company strategy. This research serves to fill a theoretical and practical gap in intelligence literature. The current state of scientific research on intelligence is incoherent, conflicting, too broad in scope, and inconsistent in terms of measurement and output value. It critically lacks reliability and validity and is not considered to be in line with what intelligence managers actually do. 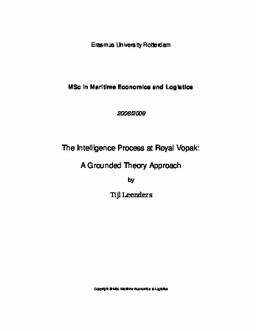 By taking a novel research approach, independent from prior literature and past empirical observations, this research uses the grounded theory approach to create a theoretically sound model of the intelligence process within Royal Vopak. The model, based upon the „best-practice‟ case at Royal Vopak, is substantially different from what has been generally accepted for over sixty years by scholars and practitioners alike. Firmly grounded in the data collected, the new model improves upon the „classical‟ or traditional model of intelligence in multiple ways. It is plausible that this model is equally suitable to interpret and guide 'world-class' intelligence capabilities within other organizational settings.